Images from 2013 to present: 06, 07, 08. Flag used from 2008-2011 and 2013-present. Granted to the city of Guadalajara on 8 November 1539 by royal act, in effect from 10 August 1542. Confirmed on 1 December 2004 by decree 20774 published on 30 November 2004; on 22 February 2008 by decree 21821-LVII-07 published on 22 February 2007; and 8 August 2010 by decree 23121/LIX/10 published on 7 August 2010. Adopted on 22 February 2008 by decree 21821-LVII-07 published on 22 February 2007. Confirmed on	8 August 2010 by decree 23121/LIX/10 published on 7 August 2010. Location: West of Mexico. It neighbors the Mexican States of Aguascalientes, Zacatecas, Nayarit and Durango to North; Guanajuato to East; Michoacán de Ocampo and Colima to South, and the Pacific Ocean to West. 1. Los símbolos oficiales del Estado de Jalisco son: el escudo, la bandera y el himno del estado. Artículo 10. Características de la Bandera del Estado. IV. Podrá llevar un lazo o corbata de los mismos colores, al pie de la moharra. Artículo 11. Uso de la Bandera del Estado. 1. Los edificios públicos y los planteles educativos deben contar con la Bandera del Estado, con el objeto de rendirle honores y utilizarse en actos cívicos. 2. El saludo civil a la Bandera del Estado es de pie en posición de firmes, con la mano derecha extendida sobre el pecho y la palma hacia abajo a la altura del corazón, y con la cabeza descubierta. III. El Presidente de la República, el Gobernador del Estado o un Jefe de Estado extranjero en caso de reciprocidad internacional, para corresponder su saludo. - The official symbols of the State of Jalisco are the coat of arms, the flag and the state's anthem. - The flag of the state is a rectangle divided into two equal vertical stripes in blue and gold from the hoist. - Centered between the two stripes bears the official coat of arms with a diameter of three quarters of the width of one the stripes. - The ratio of the flag is 4:7. - The flag could carry a rope or a cravat of the same colors bellow the truck. - Public buildings and schools shall have a state flag to honor it and to be used in civic ocassions. - The salute to the flag is in standing position with the right hand extended on one's chest at the heart's height with the palm downwards and uncovered head. + To another flag, either state, national, foreingner. + To Remains or symbols of the heroes, both national or state. + To the president of Mexico, the state governor or foreign head of state in case of reciprocity. Decree 23121/LIX/10: "Ley de los símbolos Oficiales del Estado de Jalisco"
The Kingdom of New Galicia, founded about 1532, was a constituent territory of the Viceroyalty of New Spain gaining broad domestic autonomy in 1574, excepting a short period from 1588 to 1591; the Viceroy's authority just might intervene in military and fiscal matters. Note that New Galicia was not a Viceroyaly by its own, it was named "Kingdom", though it was not governed by a King but by a "governor" who was at the same time president of the Royal Audience of Guadalajara. The capital of the so-called Kingdom of New Galicia was first established at Compostela (currently in the State of Nayarit); then on May 10, 1560, by a royal certificate, it was moved to Guadalajara. The Kingdom of New Galicia desappeared in 1786 to become the Intendencia of Guadalajara; this allowed the central government to intervene in internal matters. When Mexico achieved independence on 27 September, 1821, and became an Empire, the Intendencia of Guadalajara became the Department of Guadalajara (incorrectly known as Province of Guadalajara) as a constituent part of the Empire. On 23 June 1823, the Department of Guadalajara, became the Estado Libre y Soberano de Xalisco, a constituent part of the federal republic of the United Mexican States. Juan Manuel Gabino Villascán, July 17, 2001. New Galicia, that covered most of the current Jalisco's territory including also the current states of Zacatecas, Aguascalientes, and Nayarit, just like other kingdoms, intendencies or provinces within New Spain, had not a flag for its onwn. It is incorrectly believed that the current flag of Guadalajara was that of New Galicia, there isn't any prove of that so far. based on these photos: 01, 02, 03, 04. Until 2008, Jalisco flew a white flag with the state coat of arms in the center. It is unknown when the flag was exactly adopted. This flag was meant to be replaced by the current one adopted by the Decree 21821-LVII-07. Nevertheless, the white flag was still being used at official meetings and events throughout 2008, such as the Mexican University Games and the Mexican National Olympics. Juan Manuel Gabino Villascán, December, 2008. "The first news of the existence of a flag in the state of Jalisco came to me through a young Mexican vexilologist who gave me the description. He said that the flag could be seen in Guadalajara quite often. Nevertheless, I believe that contradictory news were mixed, on one hand the existence of a flag project with blue and yellow colours and on the other hand the exhibition of a flag with these colours as local flag of the city of Guadalajara, that apparently was based on the supposed colours of the Kingdom of Nueva Galicia. Immediately I requested official information to the governor of the State. Later, I contacted an Argentinian vexilologist living in Mexico, Luis Havas, who talked to Mr. Fernando Navarro, officer of the Centro de Atención para los Asuntos dirigidos al Gobernador (Center for the Attention of the Matters Addressed to the Governor of the State of Jalisco), who, by chance, had recived my letter addressed to the governor. Mr. Navarro said that he knew nothing about the issue, but he promised to ask the Congress and see if there was any bill in such sense. Luis Havas then talked to Mrs. Patricia de la Torre, researcher of the Congress of the State of Jalisco, who was in possession of the project about such a flag. It was, at first, a small flag that the businessmen of Jalisco gave to the governor, at the time, of the opposing party PAN whose colours are blue and white. The project the governor supported and passed it to Congress' Legal Director Mr. Palomino. The project remains under consideration, and when it is finished it shall be submitted as a bill, and if passed - and over all, if it is 'approved' by the Secretariat of the Interior (headed by a PRI member), then it is possible that Mexico will have for the first time a flag for a state. Mrs. de la Torre promised to send all the precedents. Excuse me for not having answered your letter sooner, I send you my best regards again and I inform you that the project is still under consideration, but the flag was made by Mr. Jorge García Fernández and Mr. Alejandro Fruchier, President and Director, respectivelly, of the Business Council of Jalisco. Their telephone is 013 634 89 34, ext. 207. As you rightly say it is a formidable idea, that is still under consideraiton. Any advance, if 'authorized', will be communicated to you at once. Thanks for your interest, and best wishes. There exist the project is to be submitted as a bill to the Congress in order to approve an official flag, but it is yet in process of approval by the governor. Such a project is a proposal flag divided into two vertical halves, blue in the hoist and gold in the fly; in the center the official coat-of-arms. The flag actually in use is that in white with the state arms in the center. However, as reporter also by Jaume Ollé in Flag Report 13, there is a bill on the State Flag. 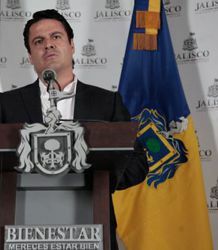 According some state representatives and Mr. Palomino (Congress Head Director and the person whom originally sent the proposal to the Congress in late 1990s), the bill (entitled Ley de la Bandera del Estado Libre y Soberano de Jalisco) is planned to be discused in the next few days by the Comisión de Asuntos Constitucionales (Comission of Constitutional Matters), if approved, then it shall be passed by the whole State Congress. This last step could take some weeks, but according Mr. Palomino, by February 2005 may have a final resolution. Thus if passed, Jalisco shall be the very first Mexican state in adopt, by law, a local flag. By the way, the desing proposed is as published in Flag Report 13 but there will be some changes in the coat of arms. Juan Manuel Gabino Villascán, December 08, 2004. Artículo 14. La Bandera del Estado de Jalisco consiste en un rectángulo dividido en dos franjas verticales de medidas idénticas, con los colores en el siguiente orden a partir del asta: Azul y Oro. Entre las franjas Azul y Oro y al centro, tiene el Escudo Estatal, con un diámetro de tres cuartas partes del ancho de dicha franja. La proporción entre anchura y longitud de la bandera, es de cuatro a siete. Podrá llevar un lazo o corbata de los mismos colores, al pie de la moharra. Artículo 15. Los honores a la Bandera Nacional se harán siempre con antelación a los que deban rendirse a la Bandera del Estado o a personas. Artículo 16. Los ayuntamientos y planteles educativos, oficiales y particulares del Estado deberán contar con la Bandera del Estado, con el objeto de rendirle honores y emplearla en actos cívicos. Artículo 17. Toda reproducción de la Bandera del Estado de Jalisco deberá corresponder fielmente al modelo al que se refiere el artículo 14 de esta Ley. - The flag is rectagular, verticaly divided in two equal bands, the hoist is blue and the fly is gold. - The State coat of arms, whose diameter (sic) is 3/4ths. the width of the stripe, is centered on the field. - The flag is proportioned 4:7. - It could carry a rope or a cravatte bellow truck. - The National Flag shall always be honored before the State flag. - Councils, and public and private schools shall own a sample of the State flag. - Every sample of the flag shall match the description given before. by Decree 23121/LIX/10: "Ley de los símbolos Oficiales del Estado de Jalisco"
published in "Estado de Jalisco" (official gazette) on August 7, 2010. Artículo 4. El Escudo de Armas de la Ciudad de Guadalajara, capital del Estado de Jalisco, que representa la historia, costumbres, idiosincrasia y valores del pueblo de Jalisco; además de los colores azul y oro, se consideran representativos y oficiales del Estado de Jalisco. III. Por timbre y yelmo cerrado y por divisa una bandera colorada con una cruz de Jerusalén de oro, puesta en una vara de lanza, con trasoles, dependencias y follajes de azul y oro. This coat of arms was given to the City of Guadalajara by Royal decree of H.M. King Carlos V in 1542, the year the city was founded. Truly unprecedented, as it was not in the policy of the Crown to give Coats of Arms to cities in the New World, it was done probobly because rather than being a conquered city, it was one that was founded anew by and for Spaniards. We can see in the centre, a tree with two lions climing it. Does this look familiar? Yes, it resembles the coat of arms of Madrid. Yet, rather than a single bear climbing up a tree, we see two lions. This is no surprise, as the New World was colonised out of Andalucía. And just like the Andalusian dialect was the one taken to the New World, so it was shown in the influence of this Coat of Arms, as Andalucía's has two lions, those were put in place of the bear. Thus, we can see the influence of both Castilla and Andalucía in Guadalajara. Jesús Aceves, 14 Nov., 1998. It is declared as representative and official of the State of Jalisco, the coat of arms of the city of Guadalajara and the blue and gold colours. Article 1. It is declared as representative and official of the state of Jalisco, the coat-of-arms of the city of Guadalajara, capital of the state, described as follows: A shield, and inside it two lions proper in posture of jumping [i.e., rampant], their hands reaching a pine of gold highlighted in green, in blue field, border of seven red saltires and gold field; for crest a closed helmet crowned by a red flag with a cross of Jerusalem in gold, attached to a spear, with trasoles, dependencies and leaves [sic] of blue and gold. Article 2. Blue and gold are official colours of the state of Jalisco. Article 3. The coat-of-arms of the State of Jalisco will be used with due respect by the dependencies of government and by the social groups that represent the entity, inside and outside the national territory, as well as by the citizens of Jalisco in general. This decree will come into effect on 8 November of the current year, date of the 450 anniversary of the Royal Decree of 1539 that granted coat of arms to the city of Guadalajara, and must published in the Official Journal of the State of Jalisco as well as in one of the State's main newspapers'.The description of the coat-of-arms reproduces literally the decree of Emperor Charles V of Germany and Queen Joan of Castille of 8 November 1539, preserved in file 230 AGI Guadalajara, Archive of Indias, Seville, Spain. Artículo 7. Características del Escudo del Estado. III. Por timbre y yelmo cerrado y por divisa una bandera colorada con una cruz de Jerusalén de oro, puesta en una vara de lanza, con trasoles, dependencias y follajes de azul y oro. - The State coat of arms is that of the city of Guadalajara. - It is rounded in the point with an abundant mantling surrounding the emblem from the top to the point. - Two lions lying in their colors on a pine three on a blue field. Seven red crooses on a gold filed border the shield. - A helmet in the top, and a red flag charged with a golden Jerusalem cross on a lance. Mantling is blue and gold. Before and during the current flag was being adopted, lots of flags, meant to represent the State of Jalisco, could be seen througout the state: hanging from hotels' flagstaffs, flying at official buildings, being used by state athletes, and adorning both official and unofficial events. The most widely used flag, even for official porposes was that in white with the state's arms in the center, which, should the considered as the state's de facto flag until 2008. Other flags, shown here, are based on the state official coulours: blue and gold, and all but two, feature the coat of arms. The decorative, souvenir "tricolor" flag with the state arms, mostly used abroad, is included as an unofficial alternative as well. It is important to remark that all of these flags are unofficial, since, at least from 2008, this is the only official flag. by Juan Manuel Gabino Villascán, May 22, 2011.
based on these photos: 01, 02.
based on this photo: 01.